Liquefied natural gas (LNG), is natural gas that is super-cooled to minus 260 degrees Fahrenheit (minus 162 degrees Celsius). At that temperature, natural gas transforms from a gaseous state into a liquid. When in liquid form, natural gas takes up to 600 times less space than in its gaseous state, making it feasible and more economical for transport over long distances. LNG is very safe to transport, and the industry’s safety record is exemplary. For over 50 years, tankers have safely transported LNG around the world. 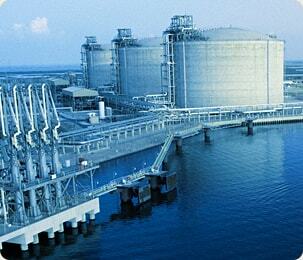 LNG is an odorless, non-toxic, non-corrosive liquid and leaves no residue after it evaporates. LNG will not ignite until it becomes a vapor, and even then, the vapor will not ignite until it mixes with air and becomes extremely diluted (5-15% vaporized gas-to-air ratio). Below 5%, there is too little gas in the air to burn; above 15%, there is not enough oxygen. What if there is a release? LNG is safely transported by sea because every precaution is taken to mitigate the possibility of a release. If there were a release, vaporizing LNG is not soluble in water and any liquid released on land or in the ocean, would quickly evaporate. There is no possibility for land or water contamination. LNG is non-toxic and it does not chemically react unless ignited. How is natural gas liquefied? Remove dust and slug (water and condensate) along with hydrogen sulfide (H2S) and mercury (Hg). These pollutants can cause corrosion and freezing problems, especially in aluminum heat exchangers. Carbon dioxide (CO2) is absorbed and removed from natural gas with an amine absorber (acid gas removal or AGR) and remove water using an adsorbent. The removal of these impure substances prevents ice from forming during the subsequent liquefaction process. Heavy hydrocarbons (C5+) are removed by fractionation before liquefaction. Natural gas is pre-cooled to about -31°F (-35°C) by propane. Pre-cooled mixed refrigerant (MR) moving through a high-pressure separator separates into a vapor and liquid. Each stream is cooled further, fully liquefied, and sub-cooled in separate tube circuits in the main cryogenic heat exchanger (MCHE). The two sub-cooled MR streams are let down in pressure, further reducing their temperatures. As the mixed refrigerant vaporizes and flows downward on the shell side of the MCHE, it provides refrigeration for liquefying and sub-cooling the natural gas. The pre-cooled natural gas moves through a separate tube circuit in the MCHE, causing it to liquefy and sub-cool to between -238°F (-150°C) to -260°F (-162°C). The LNG end flash at the outlet of the MCHE and in the receiving LNG storage tank, generates flash gas and boil-off gas to make up the fuel gas needed mainly by the propane and MR gas turbine driven compression cycles. The use of LNG is a proven, reliable and safe process, and it has been used in the United States since 1944.